Stuart has been obsessed with drums ever since he tried a friend’s set on summer vacation. After he finally got his own set for Christmas, his passion only grew as he started jamming with friends, playing in school bands, taking drum lessons, and even getting to play shows with a few of his own bands outside of school. As high school drew to a close, the decision to keep pursuing his love of drums and music was an easy one, and so he attended York University for Jazz Drums. While there, he was exposed to numerous styles of playing, picked up guitar, bass, and piano, and made connections with many other musicians. 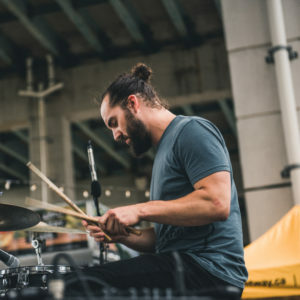 Stuart keeps busy drumming in his many vastly different bands, freelancing as a session player, and teaching so he can pass on his passion for music to the next generation. Stuart’s enthusiasm for music combined with his focus on technique and ergonomics makes for a very well-rounded teaching curriculum that keeps students having fun while also learning efficiently and effectively. He is always eager to adapt to each individual student’s interests and needs in order to uphold this standard while making sure the student feels involved in the process.